A study conducted by Ernst & Young prompts the Financial Times to publish an article on the challenges faced by student landlords. The idea of investing in student rooms was the buzz term in 2013 and 2014. But for a number of years now we’ve been cautioning our clients to give the concept a wide berth. A recent article by the Financial Times has now cast further doubt over investing in Purpose Built Student Accommodation (PBSA). Whether you’re tied to student property or looking for student investments in 2017, the article is worth reading. This type of article is nothing new, mind. For example, as reported by newspapers at the time, we suggested that Liverpool was saturated with sub-standard room investments in late 2014. But to this day, we’re receiving emails about new developments in the “underserved Liverpool student market” according to sales agents. Admittedly, there has been a decrease of promoted developments, but they’re still there if you look hard enough. If anything, these developments are now often touted around South East Asia. Off guard punters in places like Malaysia or Singapore are heavily pitched to. More recently, we know of developers that have pushed this type of investment in China. What is to blame for the negative outlook? The European Referendum outcome in 2016 is a key moment where incoming student numbers have had to be revised. But even prior to this, the number of students accepted into UK universities had taken a dip. With Brexit taking shape in one form or another, the above projection by Ernst & Young clearly shows the direction of travel for the number of students going to university. Compounded by the incumbent Government taking an anti-immigration stance, the incoming foreign numbers are now expected to reduce even more. Taking into consideration that a lot of these student rooms are targeting the more affluent end of the student market – especially the Chinese market – we can’t see who will be attracted to these expensive private halls of residence. We are keeping an eye on the market. When things go sour with this type of investment – and it’s inevitable that they will in certain areas – it will be a time to pick up a bargain. Desperate investors who bought into the student room hype will want to offload. It must be remembered, however, that a lot of PBSAs were bought using cash. With a clear lack of financing available, almost all purchases were unleveraged. So it is possible that incumbent landlords may be happy to sit on their fully owned asset. Whether the meager rental returns are acceptable or not is dependent on the landlord. What is interesting to ask is: once the heady days of 10% net guaranteed return have expired and the negative aspects of Brexit come into effect, what will go through the mind of the student room investor? It will be interesting to see what happens. An added complication is that the halls of residence blocks would, in most cases, have different investors own different rooms on a leasehold basis. How would an entire block be sold? An agreement between the individual owners would have to be enacted if some are prepared to sell at a loss. This is an added facet to the different conversations. It all sounds rather messy. However, where an opportunity does present itself – and as long as it can be snapped up for the right price – it will be a question of how to generate a rent roll. Whether that involves planning to convert the entire block into more useable rental space for the open market or finding a creative solution for these small studios will be dependent on the size of the development and the location of it. The FT article on student on the challenges ahead for PBSA investors. 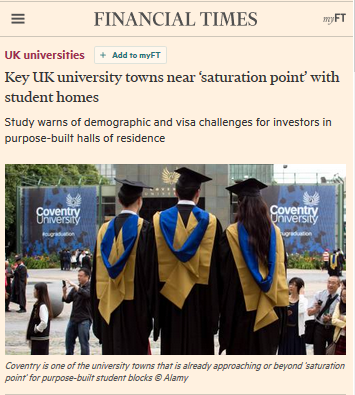 Very much like what the FT article says, we think that PBSA investors in ‘second division universities’ will struggle. While the article mentions Coventry, Liverpool, Durham and Leicester, we don’t consider all of them to have second rate universities; that is merely our opinion. In certain locations where there still is a genuine shortage, then PBSA will still do fine. In most cases, this will be where the university is highly regarded and there is a genuine shortage of student accommodation. The areas that are perceived to have a lower class of university are ones that will suffer. The local students can opt to live at home instead of paying £135 per week for a glorified bedsit with a flatscreen TV as per the sales brochure (Aren’t all TVs flatscreen these days anyway?). To play the devil’s advocate for a moment, could it be the FT writer has formed to a premature conclusion? It could be argued that local councils have encouraged the building of PBSAs i.e. to free up houses that could be used in the Private Rented Sector (PRS). The objective here is to force frustrated student landlords to sell up. In the eyes of the councils, it is then preferable that homeowners buy the property and move in. Alternatively, buy-to-let landlords purchase the house to provide a home to local residents (instead of students). The concentration of students is then focussed in select parts of town which reduces local complaints of noise, disturbance etc. and makes the whole thing a lot more manageable. Tied in with some councils actively pushing for council tax on student houses (such as Liverpool Council or Brighton Council), the immediate thought of a student landlord is to sell up. The above is all before considering the failed judicial review of Clause 24 tax changes. That only adds to the headache. What next for student investments in 2017 and beyond? There are dark skies ahead for all landlords – whether that is for PBSA investors or otherwise. The key thing is to secure yourself down over the coming years and to ride the wave. Whether that is paying down debt, reducing the number of properties or getting yourself on a long term guaranteed rent scheme. Ultimately, the onus is on you to speak to your partner, accountant and financial advisor to plan ahead.